First off, I hope you are enjoying the new website. It took a lot of work, but now that it is up and running, I feel more connected to this still-early phase of the twenty-first century. Winding down activities for the season always feels like the stakes are ramped up. You have to imagine that everything you do is in preparation for what is to come when it all starts up again in a few months. This certainly was the case in May. Starting in Los Angeles, there was a lot on my plate. Long gone are the feelings that this was my hometown, but still, there are lingering memories that pop up from time to time. 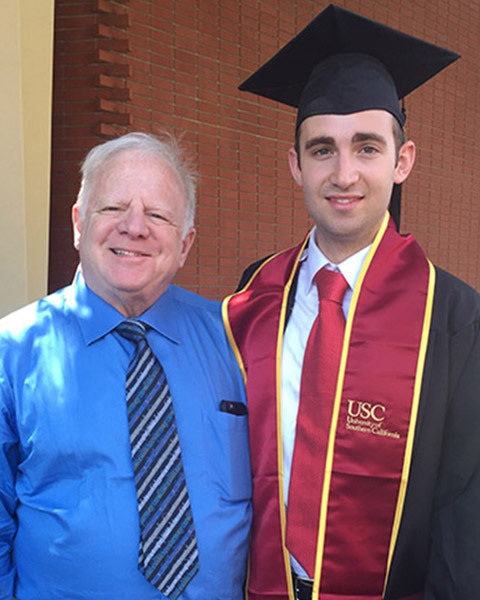 I was there for two reasons: one was to conduct the Los Angeles Philharmonic and the other was to attend the graduation of my son from USC. During my childhood, one of our household guests was the cellist Gregor Piatigorsky. The big Russian also was one of my brother’s teachers. During my week with the Phil, there was a celebration of the man and his influence. Over 100 cellists participated, and my job was to lead three of them as soloists, each playing a different concerto on successive concerts. First up was Bloch’s Schelomo, a work very closely associated with Piatigorsky. 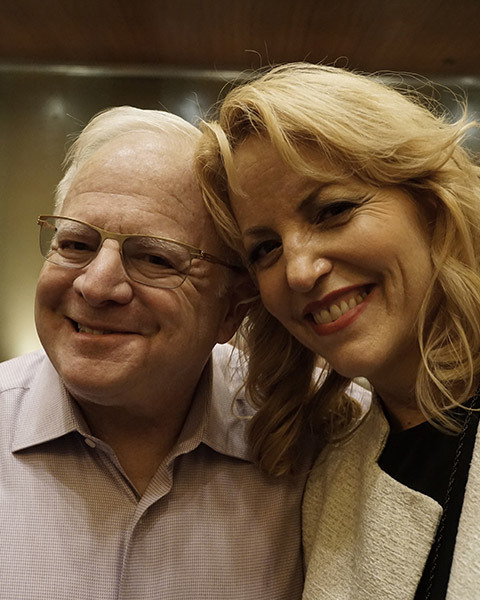 On this occasion the performance was given by the head of the festival, Ralph Kirshbaum. At one time, the epic work depicting Solomon was a repertoire staple. Much less performed these days, it still has the impact of an unfolding drama, with a large orchestra basically commenting on the wisdom of the protagonist, represented by the cello. This piece was also one of the few that my mother played with my father conducting. Moreover, it appeared on my final concert with the National Symphony Orchestra. The next day, Truls Mørk played the now-popular Elgar Concerto. It is interesting to note that at the time Schelomo was in vogue, the English work was a rarity. Most of the great cellists of earlier eras simply did not perform the piece, including Piatigorsky. When Jacqueline du Pré brought it into fashion, almost every soloist decided that this would serve as a calling card, and now it rivals the Dvořák concerto in terms of number of performances. Finally, Sol Gabetta weighed in with a piece I had only heard in recordings, the Cello Concerto No. 1 by Martinu. As is usual with this cellist, she brought a ferocious intensity to a highly neglected work, and in the process, sold it as if it were the most famous concerto in the repertoire. The piece is a wonderful display of pyrotechnics as well as melting beauty. I hope to do the work with Sol again in the future. Given the nature of the festival, I thought it was an obvious but clever idea to open with the William Tell Overture. With five solo celli playing the opening section, this served as a nice intro to the other cello works featured throughout the eight-day celebration. It was also bittersweet, as two former DSO musicians now play in LA. Robert deMaine and Dahae Kim were on the first stand, and I am proud of how well they are flourishing in my old home. The second half moved away from the lower end of the string section and consisted of the Symphonie fantastique. I have written several times about my love affair with Berlioz and his revolutionary compositions. But I can tell you an amusing story about what occurred at the second performance. You need to know that in the third movement, there is an offstage oboe part, meant to be a dialogue with the onstage English horn. I get a bit fancy and put the oboe in the upper reaches of the balcony, trying to make the conversation not only aural but physical as well. This part is usually played by one of the section oboists, who never appears onstage but only performs during this two-minute stretch. The principal oboist of the LA Phil is pregnant, but was not experiencing any discomfort, thereby dispatching the onstage first oboe part as usual. But at the second concert, just before the Berlioz, she started to have what appeared to be some light contractions. It was felt that she should not try to play the 55-minute work, and instead, would take over the offstage duties. The assistant principal, who had been up in the gallery, would now come down and take over the first oboe duties. So far, no problems. However, since my way of doing this is a bit different, the principal did not want to venture to the upper reaches, and we decided that we would put the instrument in the regular offstage position, several feet away from the stage entrance door. There is a video monitor so my gestures are seen clearly. Maybe that was true, but unfortunately we could not hear her. This was because someone forgot to crack open the door so the sound would get through to the orchestra and audience. All of a sudden, the dialogue turned into a monologue, and I could see the orchestra visibly amused at the situation. Somehow, we managed, and the rest of the performance was fine. For the final concert, contractions had ceased, and the two shepherds resumed their long-distance romance. It was with great pride that Cindy and I went to college to see Daniel get his bachelor’s degree in Music Industry. Although he is pursuing a career in composition for film and television, he used his four years to immerse himself in the business end of the entertainment world. Now he will continue studies in LA, and I believe he will become successful in his pursuit of the creative side of music. He also got a dog. This was not my graduation present to him. I stuck around LA for a few days to spend time with Daniel and his girlfriend Bridget while Cindy went north to the Seattle area to visit her parents. Joining them for two days, I accompanied them on a visit to one of the Indian casinos. My preferred game of chance is craps, but the single table was full when we arrived. Instead, I waited it out at a slot machine, not my favorite way to lose money. But on the third spin, the gambling gods decided to visit, and the wheels kept going around until I had amassed more than I ever would have with the dice. I do have a rule for myself. Know how much you are prepared to lose and walk away when that limit has been reached, but do the same for winnings. If you get to your goal, leave. And that is what I did. The total was not enough to erase the national debt, but it was enough to show off with for a few minutes. Next it was off to Boston, but not for concerts. 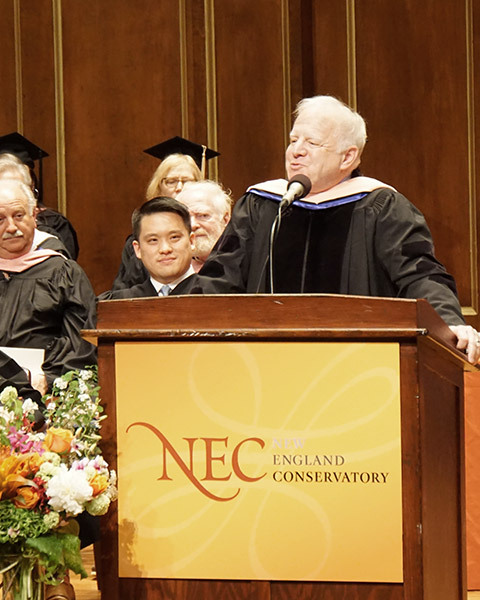 I was asked to give the commencement address at the New England Conservatory. In addition, an honorary doctorate would be awarded. I really don’t have much connection with the school, but in the short time I was there, I found it to be a very nurturing institution, and the ceremony was one of the least stuffy I have attended. David Loebel gave a touching intro, and everyone seemed to enjoy my speech. Of course I had to indulge in lobster. The final two weeks of performances were back in Detroit. We have had a fine streak of concerts this season, and these closing ones were no exception. With my dear friend Joshua Bell as soloist, Lalo’s Symphonie espagnole, a much maligned piece these days, was given a majestic performance. It was clear that the musical bond between us remains as strong as ever, and both of us took the piece seriously. That did not mean we did not have fun, and the interplay between the orchestra and Josh was remarkable. Josh reminded me that we last played this work together 31 years ago. How come he looks the same? Circumstances prevented us from giving a premiere by our resident composer Gabriela Lena Frank, but it also provided us with an opportunity to remember Steven Stucky, who passed away a few months ago. Dreamwaltzes is a piece I commissioned back in 1986, and it help jump-start Steven’s career. It remains as fresh now as it was during its premiere, and we were honored that his son, Matthew, was in attendance for one of the concerts. Prokofiev’s Fifth Symphony was the work I performed as a guest in Detroit back in 2007, and therefore could be considered my audition piece when they were looking for a music director. Like the Fantastique, I have written several times about the piece as being seminal to my career. These performances showed how far the orchestra has come over the past nine years, and the audience was more than generous in showing their appreciation. 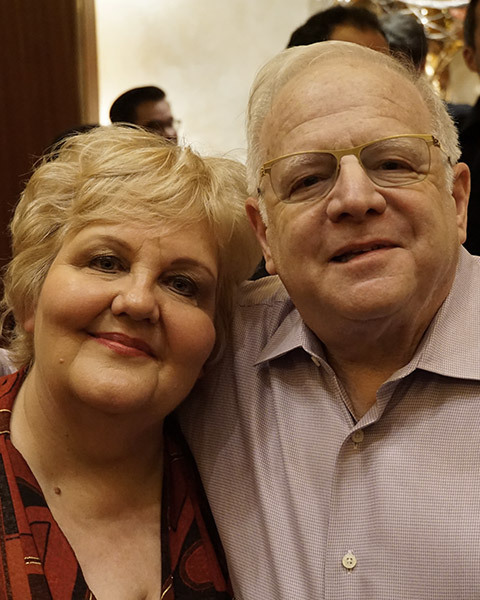 From the time I first arrived as music director of the DSO, it was my privilege to know Clyde and Helen Wu. They were the heart and soul of the DSO’s Civic Youth Ensembles, which are now part of the aptly named Wu Family Academy of Learning and Engagement. Every Saturday approximately 900 young musicians gather at the Max M. and Marjorie S. Fisher Music Center and rehearse with orchestras, wind bands, and jazz ensembles. Students of all ages and backgrounds participate in a range of educational programs all thanks to the generosity of Dr. and Mrs. Wu. Both passed away in 2015, and prior to the Wu Family Academy Showcase on May 28, their portraits were hung in our education wing to honor their memory. I led the young musicians of the Detroit Symphony Youth Orchestra in a performance of Respighi’s Ancient Airs and Dances, Suite No. 2. There is no more noble cause than taking what you know and sharing it with aspiring artists. It is not the quality that counts here, but rather the enthusiasm and camaraderie these young people radiate. The concert was a fitting end to a fine week of music making. No whimpers as far as the final subscription concert was concerned. Salome followed up on last season’s ender, Tosca. If Puccini’s “shabby little shocker” was a bit of a surprise for the audience in 1900, it is almost impossible to know what the audience made of Strauss’ over-the-top story and music. This is one of those works that drew me into the operatic world, being both post-Wagner and pre-Stravinsky and Schoenberg, at least in the guises with which we normally associate them. Having done the work both staged and in concert, I must say that having the orchestra play at its full glory in a great hall has special qualities that really are difficult to achieve in the pit. Yes, you have to temper the balances a bit, and the voices must contend with the wall of sound behind them, but when one arrives at the two interludes and the dance, there is a true focus on the genius of the composer at the height of his orchestral powers. All the dynamics, and especially the mystery, come through simply because the concert hall provides a better acoustical space than the one that exists below the stage. The DSO threw themselves into the piece and seemed to have a great time learning this challenging score. And the singers were simply among the very best one could ask for. Lise Lindstrom, Jane Henschel, Chris Merritt and Daniel Sutin all dispatched their roles with amazing vocal clarity coupled with a true depth of character, making the most out of the space they had to work with on our stage. Even the minor roles were cast with care. Easily one of the highlights of not just this season, but also my work with operatic masterpieces. With subscription concerts now concluded, all that remains is a quick trip to Lyon in preparation for a two-week tour in Japan. After that, it is on to Santa Fe for the summer, with Barber’s Vanessa and a lot of free time to hopefully finish up my second book. This past month, my drive-time listening has been devoted to legendary guitarist Jim Hall. The sheer variety of his solo playing and collaborations are enough to interest music lovers of varying tastes. His talent was not an overwhelming display of virtuosity just to show off. Everything he touched seemed unique and solely devoted to developing several musical styles. For starters, listeners should hear his albums with Bill Evans, Paul Desmond and Itzhak Perlman. Virtually everything I listened to held my attention, even his take on the Concierto de Aranjuez. A truly great artist whom I never had the opportunity to hear live. Enjoy your summer and I will see you next month.